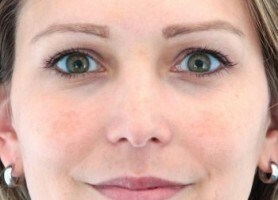 This woman has a moderate case of malsma, which is a form of hyperpigmentation that classically appears as large spots on the cheeks, a patch across the upper lip, and ocassionally a few patches across the bridge of the nose or on the forehead. Melasma usually gets dramaticaly worse with sun exposure, and with hormone fluctuations (especially during pregnancy). She underwent a series of four treatments with a non-ablative fractional laser in combination with a topical hyperpigmentation treatment and clinical sunscreen over the course of 4 months to achieve the excellent results you see here. Melasma is a very delicate skin condition that can worse severely if the wrong laser is used, so it’s always important to be treated by a laser skin care expert like she was when hyperpigmentation is the issue.